It seems children and adults alike spend hours each day consuming content, interacting with friends or learning via a mobile device. Blogging, social networking, podcasting, instant messaging, posting to newsgroups or boards, and the Internet itself have brought new ways to connect, collaborate, and share, transforming the way we live and work. These tools are altering everyday communication and transforming opportunities for learning. Given the growing ubiquity of digital media in most children’s lives, thoughtful integration of technology in classrooms can benefit children of all ages. However, in order for this to be effective, teachers must find a way to positively integrate technology with learning, and this means using it as a way to introduce new talking points, enhance interactivity in the classroom and even constructing and exploring new things. It’s a hot topic and we’re curiously watching how new initiatives are being introduced into schools via the national curriculum and forward thinking teachers. Technology companies, too, are playing their part in advancing digital literacy in schools. 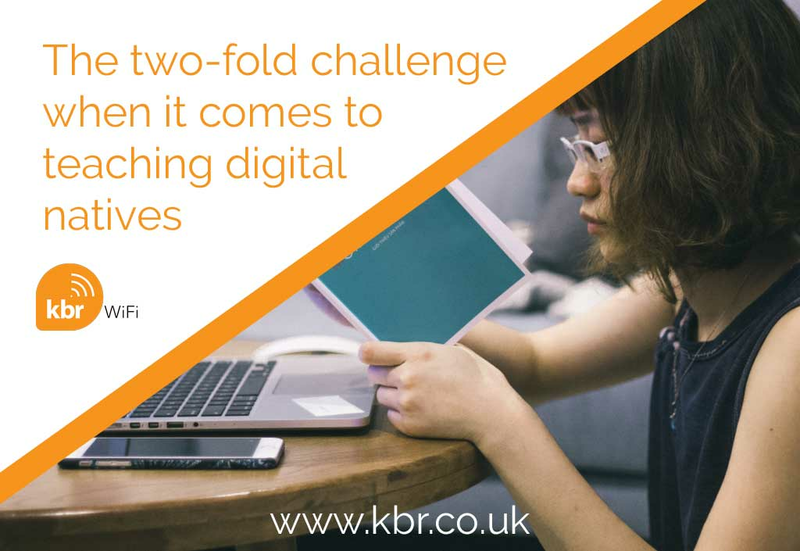 For example, at KBR, we purposefully built a fast, seamless network for our partners in education – schools, colleges and universities – can rely on and we work with our customers to develop new solutions to meet their changing needs. One requirement we have seen emerging through our ongoing work with educational establishments across the country has been the demand for personalised learning solutions i.e. providing ‘one device’ per student, and tailoring the teaching intervention per student. In some cases, we’ve introduced the devices to the school but in more and more cases we’re seeing students bring in their own devices into the classroom. This creates new demands on the network, including higher bandwidth requirements and increased security to prevent one device infecting a whole network. We’ve risen to this challenge by providing secure, reliable access to the internet across all devices. Our new KBR Secure solution provides holistic network security, allows users to use their own devices safely, enables web filtering and maximises coverage, whilst preventing skyrocketing support costs through its automatic application. However, we feel the challenge is greater than the use of technology alone and we’re seeing teachers face a two-fold challenge. Firstly, time is limited and it takes time and effort to introduce technology into the classroom in a thoughtful and productive way. Secondly, teachers can only go as far as the equipment and software provided by the school (and school budget) will allow. Another consideration is the speed at which ‘digital natives’ (children born into the technology generation) acquire new digital skills. Is it truly possible to prepare, administer and update a curriculum with the required additional teacher support that can keep pace with the advances in technology? In order to be effective in how we engage and teach digital natives, we need to firstly understand children’s learning and development practices, provide adequate learning experiences and use new technologies to promote personalised learning, and this must be adopted UK wide. Next, we need to ensure we enhance our provision of teacher education to ensure teachers are given the training and support they need – through online courses, connected learning communities, and in websites – to meet with demand. Digital technologies offer a remarkable capability for accessing information and connecting schools, teachers, students, and families within communities, around the country and even around the world and we work in partnership with schools to maximize these opportunities. We continue to engage in these discussions with schools, colleges and universities to help ensure digital natives, and teachers alike get the support they need. We have been building and managing online networking solutions for over 30 years and can offer a wealth of knowledge and experience when it comes to providing the right solution for the job, at a budget suitable to individual schools. Contact us to discuss how we can work with you to support digital natives and the teaching faculty in 2016 and beyond.